Diamond Weight: 0.875 ct. tw. 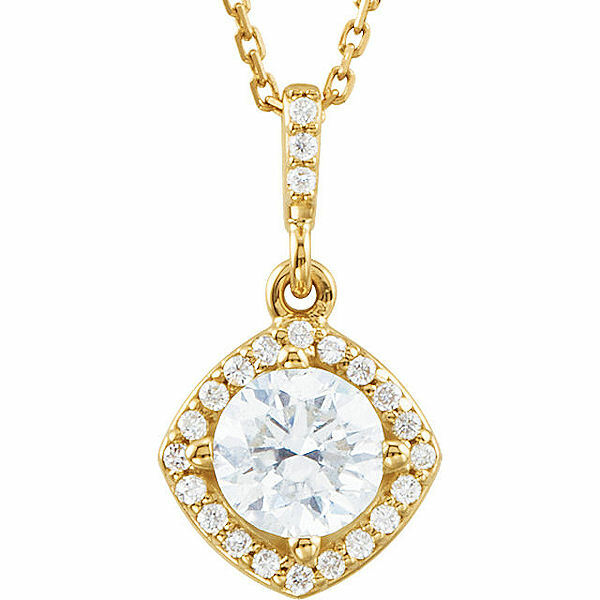 14kt yellow gold, 0.875 ct tw diamond, SI1-2 in clarity and G-H in color, halo necklace. The pendant hangs on an 18" inch link chain. Purchased identical white gold wedding bands and they were delivered very quickly even though the 4th of July weekend was looming. The rings are perfect. They actually are smaller in width than the picture showed. Very comfortable for 24/7 wear. We love our rings and will wear them many years to come. Top quality merchandisefast shipping and great customer service. I saved $120.00 from buying the band from Weddingbands.com over what I would have spent even though I live in an area that is Duty Free when buying Jewlery. I highly reccomend them for purchasing your wedding rings.